The basis of any good couple relationship is a great couple friendship. The couple friendship can be broken down into a few main pieces. 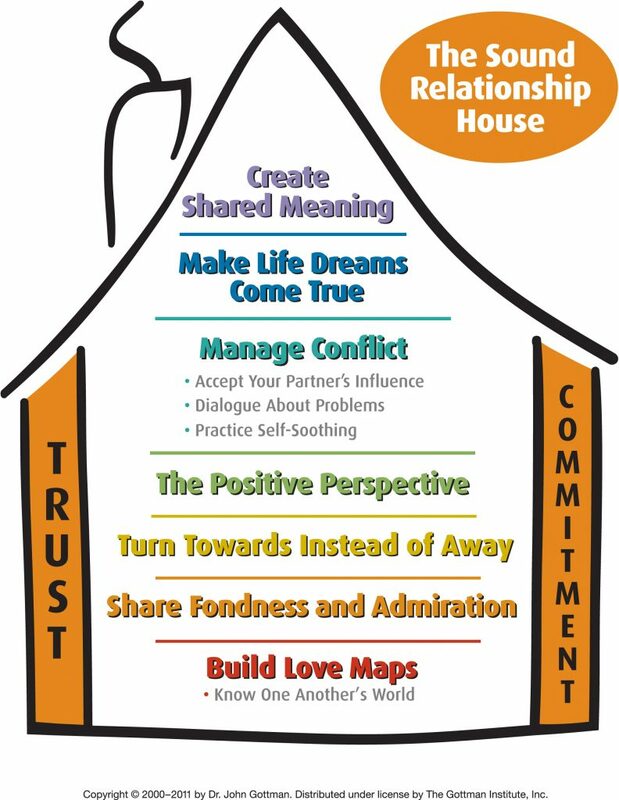 The Gottman’s love to explain the relationship in terms of a house, with levels that build upon each other logically, just like a regular house. The first floor is what they call Love Maps. The first time I heard this term, I thought, “That’s neat, what the heck is a love map?” Well, if you think of your brain as having space that gets taken up by various information, that has some level of organization to it, you can imagine it being mapped out in a certain way. Gottman discovered through their research that healthy and happy couples allot a certain amount of that space for each other. The Love section of the map, if you will. Here’s the Sound Relationship House, one great way to conceptualize your relationship and all of it’s inner-workings. So, what’s in this cognitive room in our Love Maps? Here lies the basis for the whole relationship, what we know about each other. Simply put, it’s the knowledge we have amassed over time about our partner within the space we have intentionally reserved for that purpose. It consists of things like their favorite food, what a typical day looks like for them, who their best friends are, their worst memory, and so on. Healthy couples make a good amount of room for each other in their brains and they update the info in their love maps regularly. As you can imagine, it is fairly easy to see how this floor of the house might face some neglect. Over time, the learning curve goes down, so to speak, as we amass most of the information in the beginning of the relationship. I hear a lot of couples say, “We don’t have anything to talk about anymore. We already know everything about each other.” Others complain that they don’t feel like they even know their partner anymore, because so much has changed. In either case, there’s some evidence of a dwindling maintenance of Love Maps, which being the first floor of the house, can really start to cause some foundation issues. Ah, see, that house metaphor is helpful, right? As a result, many couples begin to feel lonely and emotionally distant from each other, which starts to erode at other aspects of the relationship. The solution of course, is to get to work on making sure your Love Maps exist and are adequate in size as well as updated. This month, on the blog, my initiative is to teach you all about the Couple Friendship, the first three floors of the Sound Relationship House, starting this week with Love Maps. Later this week, I’ll post some ideas on how to spruce up that floor and get it rehabbed if needed. Be sure to subscribe to blog updates, the monthly newsletter, and to follow me on Facebook and Instagram so you can keep up with all the relationship tips and advice.